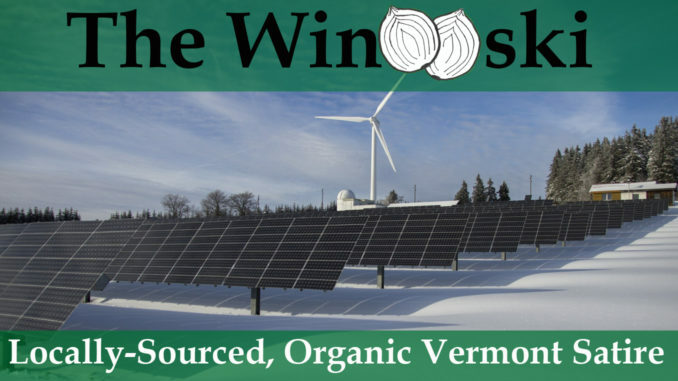 MONTPELIER – Vermont Governor Phil Scott has pledged to continue moving the state away from a dependence on fossil fuels by increasing state funding for the research and development of “Snowlar” panels, which will draw clean energy from the snow. Using a combination of previously developed energy generation methods, these new panels will use both the weight of the snow, as well as the run-off as it melts, to create and store electricity. The Governor did not say who was going to fill those new jobs, or any of the other open jobs across the state that remain unfilled, but he assured reporters that jobs and electricity were the best ways to grow the economy, and that snow was the best way to generate both.